← Mark Richt has lost control over losing control. Mark Richt walks in and sees a sea of cameras and media, comments: "It looks like Georgia football is alive and well." Jeremy Pruitt: There as many people here for this presser as there were for the national championship press conferences. UPDATE: So much for one theory. Coach Pruitt says Will Friend is his best friend and said Friend asked if Pruitt would be interested when the job came open. UPDATE #2: Be still, my freakin’ heart. "If we can't execute it, we are not going to call it"– now that is a true change of culture…. Richt says Pruitt told players: "We're gonna be simple enough where you'll be able to turn it loose and play football." What was the name of last year’s defensive coordinator? I forget. UPDATE #3: Only open slot is for outside linebacker coach. Richt said defensive assistants Kirk Olivadotti and Chris Wilson will remain on staff "if they want to." Said right now thinks they want to. Richt nixes the idea of having a special teams coach, wants Pruitt to have say in hire, new coach will have special teams background though. Richt on doing something different with special teams coaching: "I've got some things in mind for that, that I think is gonna be helpful." Jeremy Pruitt told Richt he wants to help chip in on special teams coaching. "That was music to my ears," Richt said. Good Lord. I may pass out if there’s anything more. UPDATE #5: Stop it, you’re killing me. Richt said defensive players broke out in applause when Pruitt walked in and again after his talk. "Never seen that happen before." We have a friend in Friend. Watching the presser…I haven’t seen Coach this excited in a presser in a LONG time. Both of them were so excited that their combined resting heart rate was 64-68 beats per minute. And I like that quality in leaders. Hard to work for, play for, or know when to approach an overly emotional, panicked leader. Cool under pressure…like the Man With No Name versus Boom MFer. But the psychoanalysts around here assured us that Richt was “tired”, “worn-down”, “accepting mediocrity”, and ready to hang it all up in a just a few years…amirite!? And rather than admit they might have…(ahem)…misjudged CMR, they’ll wait for the first 3rd & long conversion by Clemson to start the negative hammering again. I get the idea this might be a different philosophy. Does this mean the secondary won’t look dazed and confused at the snap? Does this mean we won’t have a Towel Boy? Does this mean we will PLAY defense, not SCHEME defense? These comments are VERY revealing, I couldn’t be happier with the way things have turned out. Does Pruitt smoke Churchill cigars? Be still my heart. Damn. I have to go take a shower now. 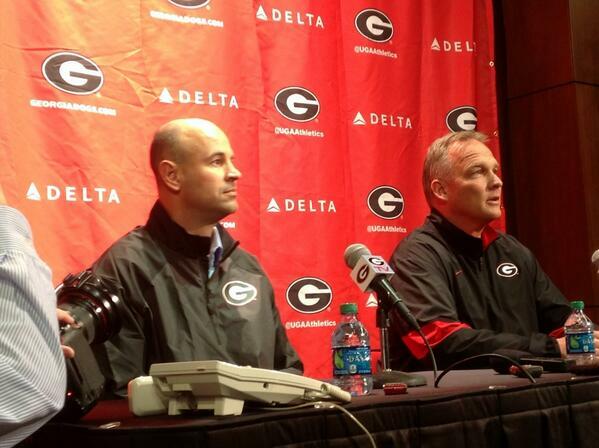 Jeremy Pruitt told Mark Richt he wants to help chip in on special teams coaching. “That was music to my ears,” Richt said. Okay, when’s the carriage turning into a pumpkin? Is Jason trying on new hockey masks under the dais, just waiting to strike? I didn’t wake up in a parallel universe this morning, did I? As UGA fans, there’s no way way we’d ever get this much good news in a decade – much less one morning – without there being some awful catch. If their ACLs all survived the walk off the dais, the football gods may be smiling on us. So, who is going to be the new LB coach? Maybe Sunseri if he doesn’t get the FSU DC job? This is surreal. Not just damn good happy talk but from a coach who has been on the defensive staff of 4 of the past 5 national champions with a specific expertise in the defensive backfield. In the Navy, when the ship has a hole in the side, you plug the hole and shore it up and if that isn’t possible you seal all the water tight doors and contain the flooding to one compartment and hope the ship can still function. Our defensive backfield has been a flooded compartment far too often. Now, it feels as if we just got a brand new ship! Euphoria all around. As a NavVet myself, hunderdowndawg, I say ” Secure from General Quarters…set condition x-ray throughout the ship”…But we’ll stay away from “anchor down”. Had to stop listening to the presser so I could get myself settled back down to work the rest of the day. Damn I’m pumped up. This might push me so far towards disney end of the scale that I might flip around to hammer. He pronounce Chair as “cheer” He is one of us. If he can pronounce “Senoia” right I’ll kiss somebody’s A. Even half the people who live there don’t know how it’s pronounced. I’m sure he knows “Allllbenny” and “How-ston County”. The other element of this is what does this do for Will Friend. I’m thinking with his good friend there and a helluva coach in Pruitt, it may make Friend a better coach. The O line had its moments…he just has to figure out how to get that to be the norm for them. Also recruit some freaking Tackles and a LS too. The Oline has been a problem for a while. Hasn’t Gates always had issues? And Houston hadn’t played competitive football in year, and Theus himself admitted that he kind of just expected to come in and play, and it was basically handed to him last year. When the Oline needed to be dominant, they were. Consistency was the problem. Hopefully that’ll get worked out with some self-realization and off-season work. I can’t imagine them regressing, though. Also, just be glad Searles (sp?) is far, far away from that group right now. Gates’ issue is that he’s a guard being asked to play left tackle. Gates played a lot of BBall in HS and is very athletic. At 6’5″ 325 with good feet he certainly had the potential to develop into a good tackle. At the end of the day he really was asked to be a swiss army knife OL . What is that old cliche about doing many things but master of none.? We’ve seen it happen often at Georgia. Plugging holes so to speak. Gates and Burnette are DGDs in my book. They weren’t always world-beaters, but they’ll be missed. Ben’s larger point about the OL is right, though. Yep. At times they looked great. He’s got his work cut out for him after we whiffed on Tunsil, as there’s maybe 1 average tackle and a ton of guards to work with, but we need 2 tackles. Whether it does or not, he’s gotta feel good about his job security for greasing the rails on such a slam dunk hire… but even moreso.. if the defense bails out the offense, then whether he improves or not, it just doesn’t matter… lol. Ed Oregron(sp?) for LB coach for a double recruiting win anyone? I don’t want that buffoon in Athens unless it’s on the opposing sideline. He might be a good position coach, but I think we can do better. You people obviously have no idea what a complete and utter shithead Orgeron has been everywhere he has been. That he spent what? 2 months as a head coach when Junior bit the dust hardly makes him anything less than a complete and utter shithead…ask the nearest Ole Miss fan. This has certainly made the offseason a whole lot more bearable. I’m drinking some Georgia red kool-aid right now, and it’s got a big ol’ shot of Grey Goose in it. I am a happy man. Plus, it’s 5:00 pm Europe somewhere. So join me if you can. GO DAWGS SIC ‘EM !!! Good to see the spirit and passion of the staff, players, fans, and supporters. Glad to see Coach Wilson and Coach Olivadotti stay on board. Thought their coaching was stellar in 2013. They are very good and I hope the AD and HC compensate them for their work and player development. Alums should really support the Dawgs now!! All one can say is wow. This guy is the anti-Grantham. What a sea change. Oh happy day! Let us enjoy it while it last, which I hope will be long enough to secure that NC. personally I think Pruitt has been reading the book, “How to Say All the Right things At Your Press Conference Book”…either that or I actually died and Erk is escorting me to 1980.
ok…so I am a little excited and have forgotten all of English 1101 usage of quotations. No sweat Moe, but I would advise taking a deep, deep breath…helped me. We got what we hoped for without anyone asking our opinions. No doubt in my mind who is a strong and silent coach running the show. Step back, Greg, your support will be called for soon so that you may understand who is really the power at UGA. And it ain’t you and the Bd of Regents when it comes to our football program. March on Coach Richt. You da man!. I love this blog and it’s author. What was the comment he made about running a 4.4 to the wrong place?